Today is the day I officially became a Common Core Grinch. It being conference week for teachers and the high stress time already, I sat in my office reflecting upon the effects of Common Core and the impact it is having upon the classrooms of our nation. The image of the grumpy, ole’, green Grinch came to mind. My face definitely mirrored the contortions Jim Carey became so famous for in the movie of Dr. Suess’ beloved Christmas Story. I most likely will never star in any movie for my facial expressions, but I am sure mine are just as ugly. I joined this discussion thread and posted the question, “By chance, is your district using EngageNY?” My suspicions were affirmed. Spokane Public School District is using EngageNY too. I could spend the rest of this post copying and pasting several more like comments. I think two is enough to drive the point home. There is a problem festering and brewing and soon will be boiling over. Anything done in haste usually does not end well. You’d think if this math program was to be put into the hands of teachers and used to instruct our most precious commodity, there would be a full review of the program by math experts? It seems logical there would be time taken to find out what other school districts using it were finding? Or consider even the state of New York dropped the program as currently written? Or how about this one… determine if it was field tested in real classrooms with real teachers with real children? No? And if it so happened it was field tested, which it was not, was there an examination of its results? Hmmmmm…. For most school districts, none of the above happened. Thenceforth, should anyone be surprised an outcry… or downright outrage… is catching fire? What is the rush all about anyway? 2) Pearson Education Can Run, but it Can Not Hide. So what pushed me over the edge today? From concerned educator and mommy to the cantankerous Grinch? The wonderful special education teacher in my building came to my office with a student assignment in hand. She pointed at a question and asked me for some background and help. Zero in on #1. Write the opposite of the opposite of -10 in an equation. Think about this for a moment. What grade level do you think this is from? 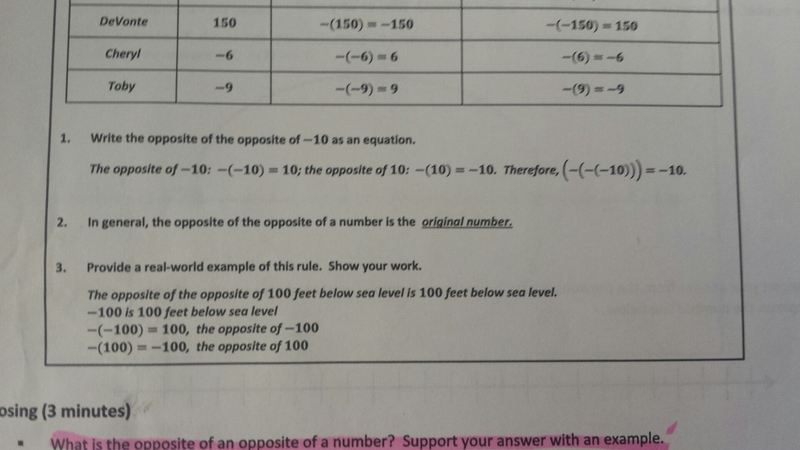 “Understand a rational number as a point on the number line. Extend number line diagrams and coordinate axes familiar from previous grades to represent points on the line and in the plane with negative number coordinates. Does reading the standard bring clarity to this question? Is it easier to determine what grade level our children are expected to master this skill? And my dear colleague affirmed I did not turn green. The Common Core Grinch emerged. Wrong color, but the Grinch still. Can we stop just for one moment and ask ourselves a few sensible questions? Is this critical to the student to master at this point in her educational career? How does this child learn? Is she an auditory learner? Is she visual? Does she learn by doing (kinesthetic)? What pre-requisite skills does this child need in order to be successful? And this is where most of us need to give pause and ask ourselves what we are doing to our children, and dare I ask…. what toll is this taking upon the many gifted teachers in the classrooms across the nation trying to make sense of this sleigh pulled by a dog with tied on antlers? May I boldly suggest the quickly written EngageNY materials peppered with errors do not address children’s learning modalities? May I boldly suggest the pacing of the lessons leave students farther behind and give no opportunity for review? By highlighting two of the ten errors he exposes, my evolution to the solid Grinchhood state will become obvious. EngageNY is a direct result of the push for national common standards and a fulfillment of Cody’s predictions embedded in the following errors. “Error #2: The Common Core State Standards violate what we know about how children develop and grow. Such standards will lead to long hours of instruction in literacy and math. Didactic instruction and testing will crowd out other important areas of learning. There is little evidence that such standards for young children lead to later success. “Error #4: The Common Core creates a rigid set of performance expectations for every grade level, and results in tightly controlled instructional timelines and curriculum. At the heart of the Common Core is standardization. Every student, without exception, is expected to reach the same benchmarks at every grade level. Early childhood educators know better than this. Children develop at different rates, and we do far more harm than good when we begin labeling them “behind” at an early age. The Common Core also emphasizes measurement of every aspect of learning, leading to absurdities such as the ranking of the “complexity” of novels according to an arcane index called the Lexile score. This number is derived from an algorithm that looks at sentence length and vocabulary. Publishers submit works of literature to be scored, and we discover that Mr. Popper’s Penguins is more “rigorous” than Steinbeck’s Grapes of Wrath. Cue the Thomas B. Fordham Institute to moan that teachers are not assigning books of sufficient difficulty, as the Common Core mandates. Would (or should) a 6 year old understand the question, “Which is a related subtraction sentence?” My nephew’s wife, who teaches Calculus, was stumped by that one. Having honed in upon two of Cody’s ten errors, let’s go back to the student problem. What is the opposite of the opposite of -10 written in equation form? Will this content help this young special education student become ready for college and career? My gut tells me there are other foundational mathematics skills she has not yet mastered and deserves the time and quality instruction to learn at her own pace in order to develop authentic mathematical understanding. So… what’s the story behind EngageNY? Who wrote it? Often times, we teachers take what is given to us, and just make the best of it. Very true. We are rule followers and do what we are told. Don’t want to rock the boat or possibly call attention to ourselves. After all, we are now under a new evaluation system in which our principals rank us in around 41 standards. We must show we are teaching the materials with integrity, we must prove our students are mastering the common core standards, and now there is even legislation in many states, including Washington, to tie our teacher evaluations to how well our students perform on the SBAC test. Some states have already passed this kind of legislation. How does this set up any teacher to have open dialogue regarding their instructional practice or to analyze a program and deem it inappropriate? How does this create a risk free environment in which the hard questions can be asked by the very educators living and breathing in the trenches alongside our children? I laughed to myself as I did my first Google search and found David Greene, author of the book, Doing the Right Thing. He’s a skeptic just like myself. The same questions below were festering inside of me one August day this summer. Interestingly, EngageNY was NOT written in New York. The Department of Education in New York contracted the job out to a company called Common Core, Inc. located in Washington D.C. It was funded by a national grant and once written it had to be made available to any and all whom wished to see it and use it. It basically went viral and has been “adopted” by many school districts throughout the United States. 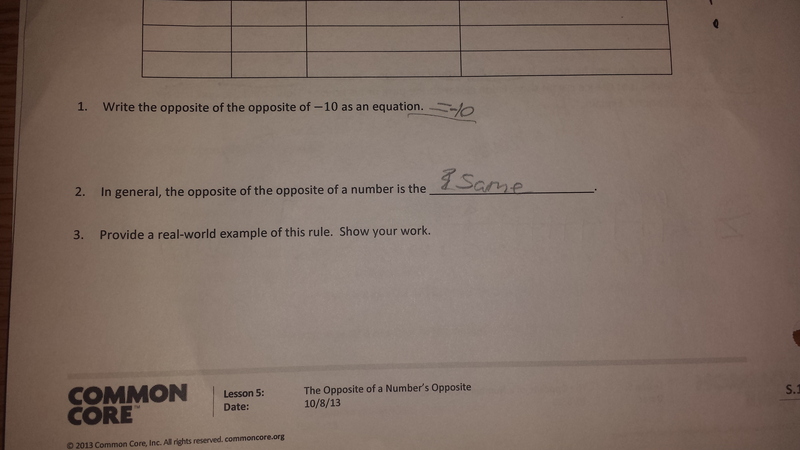 Because of the wide spread use, Common Core, Inc. saw the mighty dollar sign. So… this same company started a new company called Eureka. Eureka bought the full rights to the Common Core, Inc. written EngageNY. Here’s the problem. Because EngageNY was written so quickly, it was filled with errors. Because it was never field tested, there were many lessons found to be lacking. Eureka, the same peeps, now had the time to go through every module and fine tune the program. The original writing paid for by the benefits of a national grant gave the now “for profit” Eureka the luxury of time to correct the errors and to make subtle changes to the lessons. How nice for school districts everywhere. They can now purchase this “comprehensive” program. How’s that for the commutative property? School districts are still allowed to use as much of the old error filled version of EngageNY. It remains “free”. If school districts want the new and improved version, well, they now have to fork out the dough. I will end Part One here. I’m hoping my story will end with a softened heart and a happy ending for the U.S.A. educational system. For now, though, when it comes to the Common Core Standards and EngageNY, I have been Grinchified. As a 29 year high school math teacher, I applaud your illuminating post. I’m sending it to people who aren’t in education and wonder what the debate is all about. I do have one suggestion, though: in mathematics, reversing the order of an equation (switching left and right sides) is the symmetric, not commutative property. I know it’s picky, but you know how people are…thanks for your work! 2 + 3 = 3 + 2. Both equal the same thing… and also symmetric! My main point was… it doesn’t matter the order… EngageNy and Eureka same same.